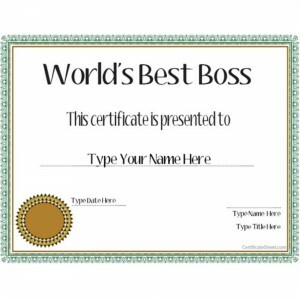 National Boss’s Day is October 16th, which is coming up sooner than you think! Plan ahead this year to get personalized gifts for your boss that go beyond a generic card or disposable bouquet of flowers or chocolates. Give something that is not only a token of your appreciation but also conveys the thoughtfulness and sentimentality that went into choosing the gift. So what kind of gift should you give your boss? What if you don’t know what he or she likes? What makes a great personalized message? We list the top gifts according to what kind of boss and relationship you might have, as well as some inscription inspiration! 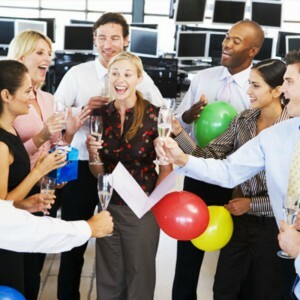 Plus we detail some great celebratory ways to show your boss just how much you care. For the fun-loving boss who thinks casual Fridays are a great idea and wants to make every employee’s birthday a special one! 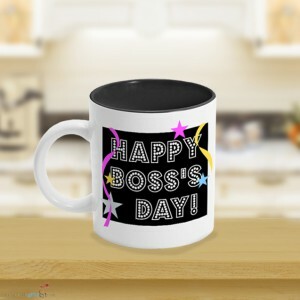 This Festive Bosses Day Mug can be personalized with a special message from you – letting them know in addition to all their hard work you also appreciate their passion for whimsy. Notice your boss’s desk is need of some organizational assistance? 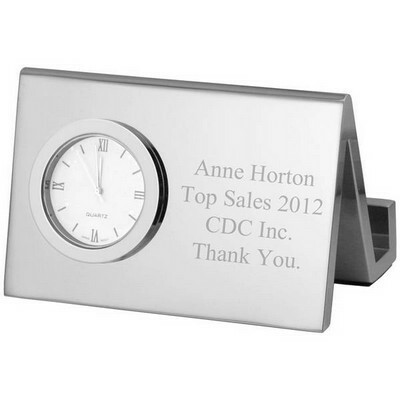 Business cards will be scattered no more with this Personalized Silver Desk Clock with Business Card Holder! 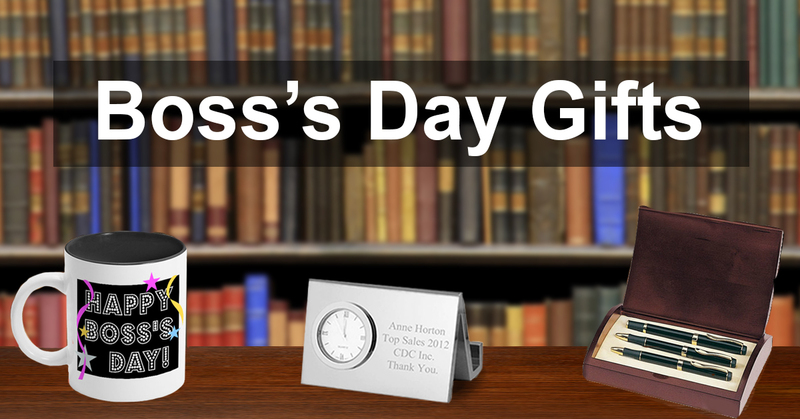 The personalized silver desk clock with business card holder combines the best in desktop accessories into one perfect gift! Fix up your boss’s office with some light decorations before they come into work and plan with your coworkers to bring in some snacks for a small celebration. Or if everyone is up for it, take the office out for lunch and pitch in to cover your boss. It’ll be a great time for everyone, and most importantly an amazing memory for your boss. Every manager or CEO of a company has that treasured pen they carry around in their pocket all day long. Unlike a regular set of pens they’ll be likely to lose, this Personalized Executive Ball Pen & Pencil Set is one they’ll be sure to guard close! 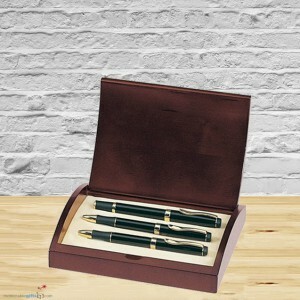 Leave a high caliber impression with this engraved cherry luster finished case and roller ball pens. Does your boss have a stack of books on his or her desk and likes to sneak off at lunch to get a good quiet reading done? This is the gift for them! Personalized Book Ends will not only appeal to their love of books, but also allow for you to include some inspirational quotes or words of appreciation. For the thoughtful boss that likes to have brainstorming meetings and write down staff suggestions, this Executive Business Desk Journal is just the right fit. 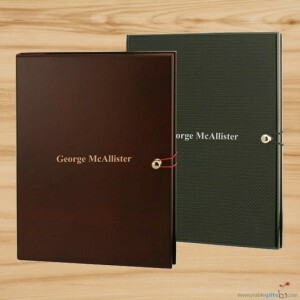 Personalize the wooden cover to this journal with the recipient’s name, initials or company name and/or logo for a gift that will never be forgotten. Everyone could use some recognition now and again! Hand out awards to all supervisors in the office. Keep the awards light-hearted: honor the funniest boss, the best-dressed boss, or the coolest boss. It’ll guarantee to put a smile on their face and lighten up the office mood. Time is of the essence! Every boss knows this so a commemoration of the importance of time is sure to bode over well with them. 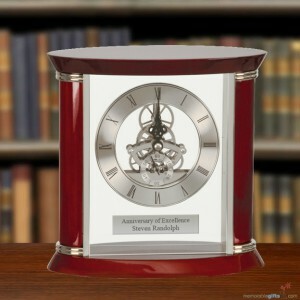 A personalized clock takes a classic office staple a step up to something more unique and thoughtful. Engrave it with their name and title or a phrase of appreciation. Is your boss a hard worker who rarely takes vacations but is in need of a break? 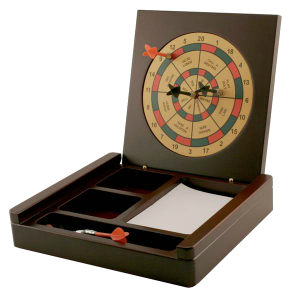 Let them know there’s no more excuses with this Personalized Desktop Dart Board Stationery Box! They can keep it in their office and take it out whenever they need a 5-minute breather to recapture their thoughts. 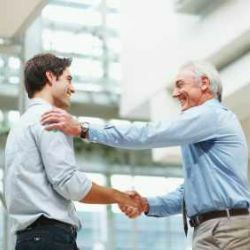 The simplest and often most effective way to celebrate this holiday is by cheerfully wishing your superior a “Happy Boss’s Day!” followed by a phrase of gratitude such as “thank you for everything you do for the office” or “I really appreciate all that you’ve taught me.” Your genuine sentiments will be sure to brighten up your boss’s day.